Kelsey Odom’s Third Grade class from Harold S. Winograd K-8 School will be going to Houston Gardens on Wednesday, May 10th. The WGCD covered their transportation costs for this Plant Life Cycle field trip. The students hope to see adult plants with flowers, some with fruit/seeds and some just sprouting so they can see all the stages in a plant’s life cycle. Students will bring a field trip book to draw sketches and take notes. Explain and illustrate examples of adult plants and their characteristics. List reasons why plant life is important to a community. Describe the role of a community grower. Houston Gardens will welcome 7-12 year old kids who are participating in the SEVA Community’s annual Brain Camp June 5-9. SEVA supports children birth through kindergarten, and their adults with early literacy and brain development interactive practices. Community volunteers and retired educators have been nurturing young families for so long that now older siblings don’t wish to miss out on these exciting learning experiences. Director Terri Pappas, in the spirit of her mission, believes all children should have access to meaningful interactions with adults and has recruited assistance from WGCD. Our involvement just makes good sense with our commitment to education, and since SEVA is located just across 23rd Avenue to the east of the Gardens. We are happy to engage these kids providing a couple meaningful hours of activities Tuesday and Thursday. We have planned a nature walk, learning about bugs and pollinators and what plants attract them. We will identify plants and talk about the importance of sun, weather and water to the growing cycle. They will be introduced to the always popular Riparian Trailer. We will do some bird watching and identify species and then make bird feeders for the kids to take home, plus coordinate a natural resources scavenger hunt. 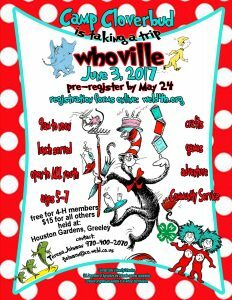 On June 3rd, Weld County 4-H will host “Camp Cloverbud-Whoville at Houston Gardens” for 4-H and community members ages 5-7. With upwards of 50 day campers, there is always a lot of fun to be had, all overseen by Senior 4-H members who help out by serving as camp counselors while community volunteers help with the many stations offered during the day. Always a big hit, we look forward every year to opening-up our lives to these many up and coming 4-H youth and 2017 will be no exception. We have lots of fun project workshops to look forward to. 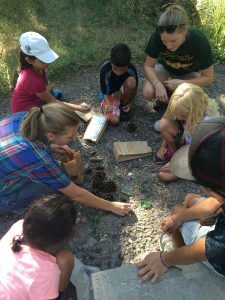 Campers will be building Doodle Bots, planting Mini Whoville Gardens and enjoying the beautiful landscaping of Houston Gardens with a Horton’s Hike. We hope to provide either hot air balloon rides, or a paddle across one of the area ponds to emphasize “Oh the Places You Will Go.” One of our favorite Dr. Seuss quotes is “UNLESS someone like you cares a whole awful lot, nothing is going to get better. It’s not.” ..and to that end our community service project will be packing back packs for kids who are entering foster care. We welcome any community youth age 5-7 to join us at the 2017 Camp Cloverbud. 4-H Cloverbuds are free of charge and non 4-H members have a nominal fee of $15. 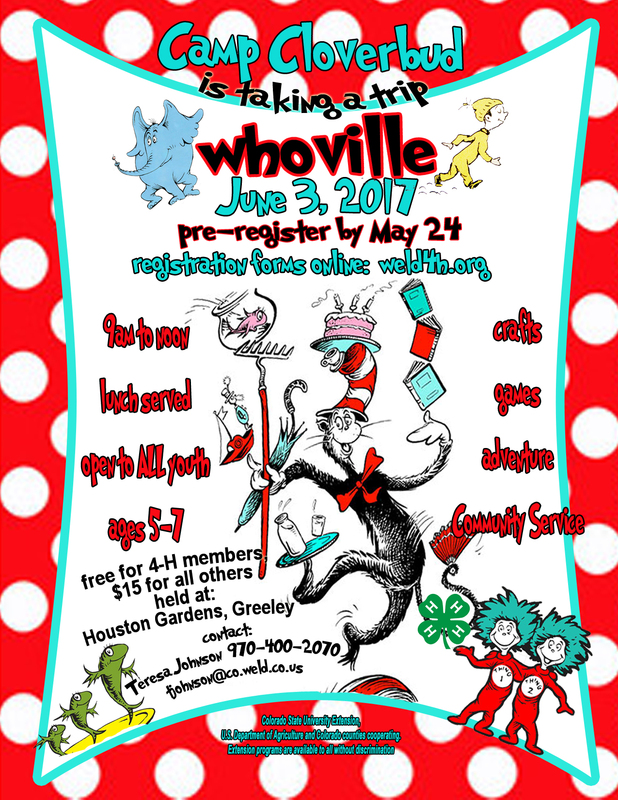 We look forward to working with Houston Gardens and the West Greeley Conservation District on this fun event!